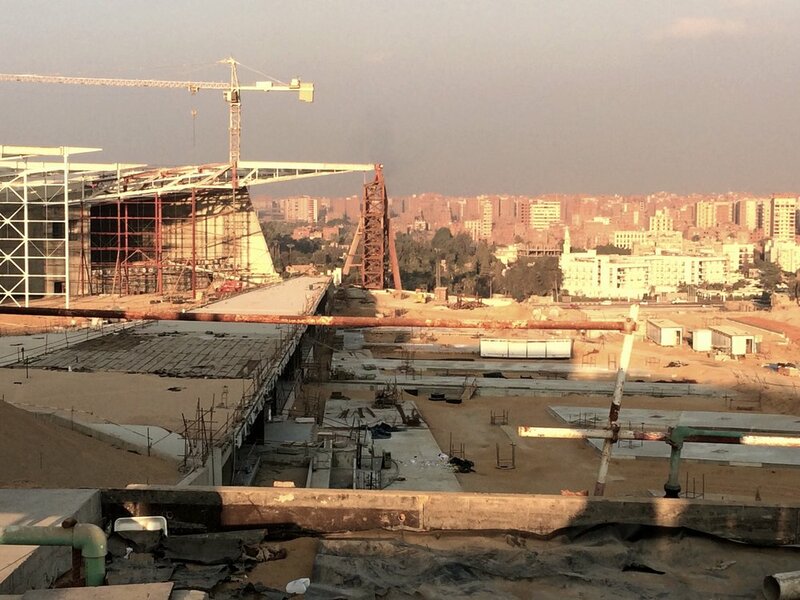 Grand Egyptian Museum - GEM of Giza — Art Construction Management - Art constructs Reality. 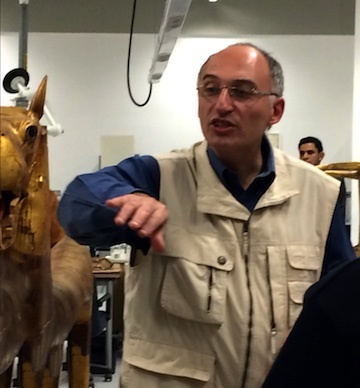 During a brief visit in Cairo, my fellow travelers and I were introduced to general director, Prof. Dr. Tarek Tawfik, his staff and conservators of the Grand Egyptian Museum (G.E.M.) 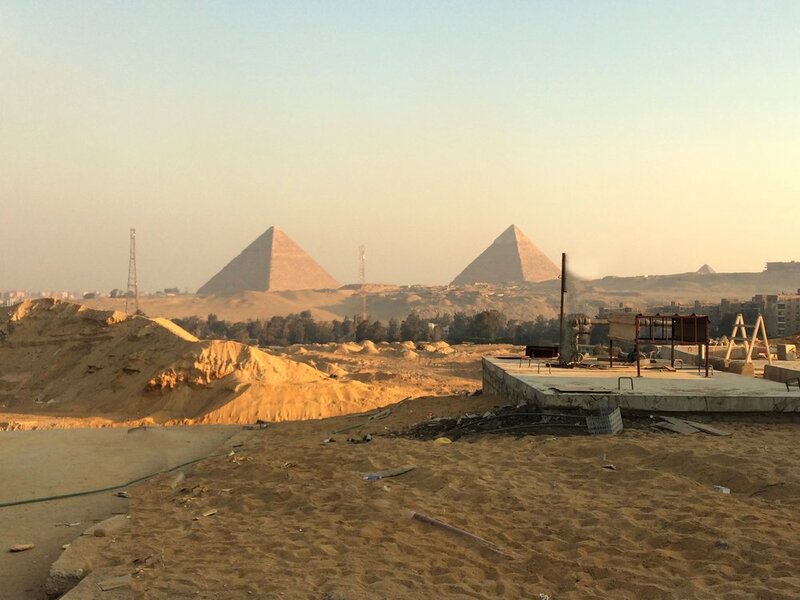 which is under construction in the desert on the edge of a bluff looking toward the pyramids on the Giza plateau. Designed by Heneghan Peng, the museum is placed between the level of the Nile Valley and the plateau, never extending above the plateau. When completed G.E.M. will be the largest museum in the world dedicated to a single civilization. Conservation labs and climatized warehouses were built first and are now in full operation. Labs are arranged by media: paper, wood, stone and heavy stone. 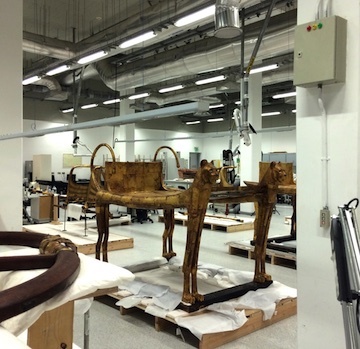 A pharaoh’s gilded chariot greeted us as we walked into the wood lab sparkling in gold light. We walked beside wooden coffins still brightly colored after three thousand years in the dark. Egyptians were manufacturing mixed metal oxides including lead white and Egyptian blue before 2500 BCE. Pigments on display included Iron red boosted with hematite, limonite yellow and a lively green based on copper acetate (also used as a fungicide). 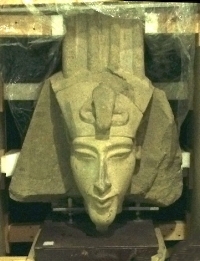 In the heavy stone rooms where the ceiling-mounted cranes can lift 20 ton sculptures, there were new arrivals including a statue of Sekemet, goddess of healing. The director explained how archeologists recently discovered over a hundred statues of Sekhemet. Another team of scientists will study why so many were found so close together. 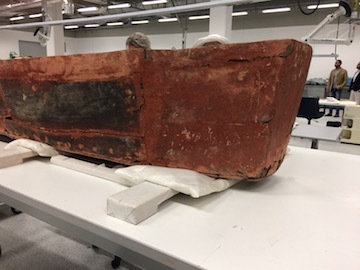 Another new arrival still crated was a stone head of of Akhenaten (ruled c. 1350 to 1336 BCE), founder of a monotheistic religion that did not prove popular. When he died, he was cursed — intentionally forgotten. His tomb desecrated. His son King Tut returned the old gods of Egypt to their temples. For this, Tutankhamun was so revered that his pyramid was already filled with treasure when he died at 18 or artisans filled it really fast with object and script of extraordinary quality. 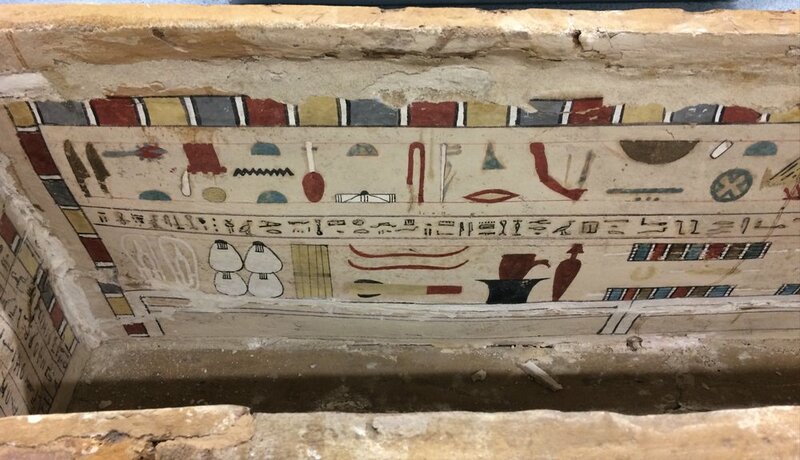 The Grand Egyptian Museum begins a series of openings in the spring 2018 with a spectacular display of 5,000 artifacts from King Tut’s tomb, many of which will be on display for the first time. Egyptian and Japanese taxpayers are underwriting the building costs. The conservators would really appreciate the support of artists, in particular, throughout the world to help support art conservation.